If the discipline of process management, improvement and optimization is so valuable, why is it not more pervasive in the fabric of companies? What might need to happen to make it so pervasive? One answer: Embed it everywhere and make it easy to obtain its value. Embedding BPM discipline and its enabling technology throughout a company results in the benefits of process management becoming accessible to everyone. Some form of process modeling, automation, monitoring and reporting can then be done by all employees rather than a select few “process experts”. Continuous process improvement is then supported through instinct, experience and observation rather than just through formal analysis. Process skills become more broadly internalized and practiced as a fundamental work habit. 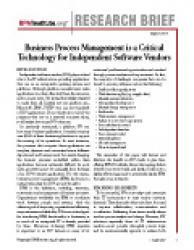 A critical partner in the objective of embedding BPM is the Independent Software Vendor.